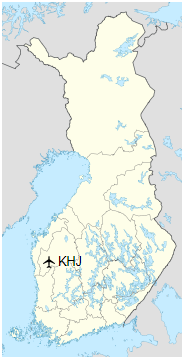 Kauhajoki Airfield (IATA: KHJ, ICAO: EFKJ) is an aerodrome located in Kauhajoki, Finland, about 8 nautical miles(15 km; 9 mi) east-northeast of Kauhajoki centre. The airport resides at an elevation of 407 feet (124 m) above mean sea level. It has one runway designated 07/25 with an asphalt surface measuring 1,160 by 23 metres (3,806 ft × 75 ft).